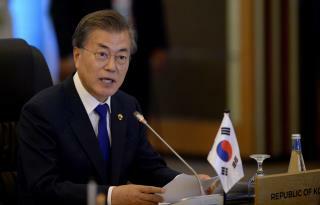 (Newser) – Even if North Korea were on board, it would be "realistically difficult" to destroy the country's nuclear capabilities because they're so developed, according to South Korean President Moon Jae-in. It's for this reason that the international community must pressure North Korea into talks as soon as possible, including through use of sanctions, Moon said Tuesday, per Reuters. Moon added the PyeongChang Winter Olympics kicking off in February might provide a rendezvous point for talks, reports Yonhap News. But though the North has said it may be open to dialogue, it hasn't responded to invitations to take part in the Olympics. It has also said it will "never put the issue related to the supreme interests of the DPRK and security of its people on the bargaining table," per Reuters. Looks like Mooney has already given them a pass on destroying the nukes what is left. NK is preparing an atmospheric test because they collapsed their underground site. Until we undiscover how to split the atom for weaponry ... OMG, why are we needful of an indirect path towards neutralizing nuke proliferation? What is wrong with these Liberal Lames who shrink from their duty as 'leaders' of their nations that they cannot demonstrate balls by stepping up and telling the pissant thugs who pursue WMD, 'Look the nuke genie is out of the bottle BUT from here on in humanity will limit them to the few with the most to lose and rely on their discretion and desire to remain the great nations of Earth to prevent their use. You tiny brain tyrants who equate possession of nuclear arms with equity among the great nations are on notice, NO EFFIN' WAY! If you want to be a great nation, Free Your People, Provide For Them The Opportunity To Achieve Their Own Destinies, and Live In Peace With The Rest Of Us!